Choosing, buying and selling a tax-free car on MM2H visa in Malaysia. May 2013 update. One of the biggest advantages of getting a retirement visa in Malaysia is being able to buy a car tax-free. In our case we saved about MYR 40,000 (GBP 8,000). You can only buy one car tax-free. If you want to part exchange for a new car in the future, though, or simply want to sell the car, it is not as easy as you might expect. We took the easy way, and used the services of our visa agent, who will do everything for you: explain the system, take you to car showrooms, and once you have selected a car, do all the paperwork for you. Then you wait for up to several months for the car to be manufactured/assembled, and then be delivered to you. The agent’s fee is only a small amount compared to the tax savings. The visa agent will probably also take care of arrangements to part exchange or sell your tax-free car. However, the car dealer you are purchasing your next car from may also help you, in which case you can avoid the agent fee. You may find it helpful to go with someone who speaks Malay, otherwise. It seems that even if your car is several years old, you cannot sell without this bureaucratic procedure and paying some of the tax that had been previously waived. The following is the procedure if you live in Penang. The Butterworth Customs office telephones you and you return to the office to pick up the reply from the PJ office. This letter tells you how much tax you must repay. You take the letter to an office above the post office in Beach Street (7F?) and pay them the tax by bank draft, and receive a chop and a receipt. You need to download a form from the road tax department, and then go to JPJ (Road Transport Department) at Bukit Jambul with this form, receipt, the passport you had at the time you bought the car, and the car registration form – and copies of all these, and a copy of your visa. JPJ takes the registration form and gives you a receipt. You are now done. You can hand the car over to the dealer, or purchaser. In all the countries I am familiar with, the major cost of car ownership is depreciation in the value of the car. Buying a good secondhand car, and thus bearing a lot less of the depreciation costs, was probably the cheapest path to car ownership. A more expensive, but perhaps more attractive approach, was to buy a new car, but keep it for many years – you bear the depreciation, but over a good many years, so that per annum it works out quite low. A friend kept her Honda Accord for 27 years!! It was a bit shoddy, but still performed well, when she gave it away to a friend of hers. “…the import duty on cars from Japan and Australia would be gradually reduced from the current 30% to 0% by 2016. He said the import duties would be reduced to 15% in 2013, 10% in 2014 and 5% in 2015. It was possible to buy a car under an MM2H visa, use it for five years, and then part exchange it for a smaller new car for a very small extra payment, because some cars hold their value very well, particularly Japanese cars. For example, buy a Honda Civic, use it for five years, and part exchange for a Honda Jazz. Or an Honda CRV, and then a City. With the changes in the government’s various taxes on cars, it looks like a less viable plan of action, as second hand cars are unlikely to hold their value so well. To date, Japanese cars have maintained their value best. But the manufacturers are slower to build in new technology than the Korean and European manufacturers. And the “luxury” European makes depreciate very fast here, so if you want one, buying second hand might be sensible. Of course, this would mean not taking advantage of the MM2H concession, so instead, if you owned one in your home country, it could be better to import it. So, if you want a luxury European car, importing one you owned, or buying here second hand is probably best. For other cars that are assembled here, buying new under MM2H, and then keeping long term is probably the cheapest. Health note: Bangkok airport now, it appears on a sporadic basis, employs full body scanners, which scientific studies have shown cause cancer, and damage DNA. In the US the machine attendants are coming down with cancer. Besides, many dangerous objects have been snuck through them, and so they are not even effective. I for one will not fly out of Bangkok anymore. An alternative to flying to Malaysia is catching the train south. 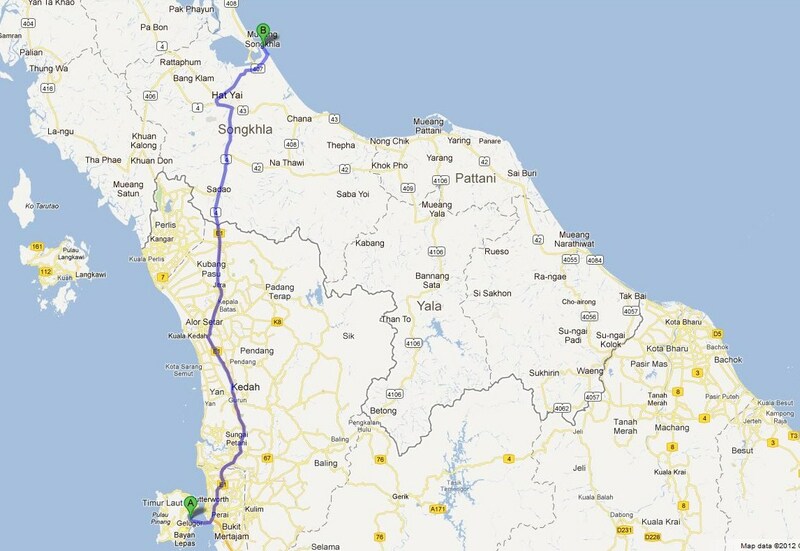 I am planning sometime this year to catch the train from Bangkok to Penang. The first step was to check The man in Seat 61. There you can find good information and photos. The information here is in addition to Seat 61. Then I asked a friend who has done the journey a number of times. You have to buy a ticket at the station in Bangkok. They speak English. There is only one class of travel to Butterworth. However, there are upper and lower bunks. The lower is far more popular as there is more headroom, and a window.. The ticket is about RM110 for the upper bunk, the lower a bit more. The station is at the end of a subway line, so easy to get to. There is only one train a day – around lunchtime. Two carriages go to Butterworth. It arrives about lunchtime in Butterworth. But the train can be three or four hours late arriving. Food is available on the train – the conductor comes around and takes your dinner order fairly soon after departure. Dinner is basically Thai food. Beer is available anytime and isn’t expensive. You can also get food when the train stops at stations. The train is reasonably clean, and the bedclothes are clean. There is a basin and a toilet at the end of the carriage – which is not clean. There is no shower. There aren’t mosquitoes. The aircon is too strong so it is cold. The beds are made up around 8 or 9pm, and then people tend to sleep. And the beds are returned to seat state when people wake up – but it is done so noisily everyone wakes up. Scenery tends to be paddy fields in Thailand and jungle in Malaysia. The train stops at the border, and everyone disembarks, and goes through first the Thai Immigration and Customs, which is quite quick and not thorough, and then through the Malaysian equivalent, which is much slower and may check luggage. Then it’s back on the train – which hasn’t moved. All told it takes less than an hour to cross the border. At Butterworth the train terminates, and then you can catch the ferry across to George Town, Penang. Now I have made the trip, which you can read about here. Short answer – everything you can. It is quite cheap moving from the UK to Asia, probably because many goods are being shipped in the other direction, and there is plenty of space on the ships when they return. Especially, bring kitchen items, oven, dishwasher (very expensive here), mattress and bedclothes, furniture, DIY items. Electronic goods tend to be cheaper here than the UK, but furniture, crockery, glassware, etc. may well cost far more here, if you can even find what you want. If you have possessions you like, it can make a lot of sense to bring them. So bring as much as you can, and as long it is used, if you have an MM2H visa, it should be free of duty. Don’t leave any unused space in your container. Of course, it makes a lot of sense to come here with the minimum, and not ship your goods until you have decided both you do want to live here, and where you want to live. This will take at least six months, and perhaps a year or two. If you ship your goods before you settle here, be aware that if you use a reputable international company, and have paid for a door to door packing, delivery, and unpacking service, it should go quite smoothly, although you will still need to supervise the packing, and especially the delivery and unpacking on the Malaysian side. They take care of the paperwork, so there is nothing you need do about that, and once the delivery date is set, be at home, with at least two of you – one to watch the unloading from the lorry, and one to watch the delivery into your house or apartment. On delivery in Malaysia, I watched in shock as six delivery men formed a line spaced about six feet from each other, and started to throw boxes marked “fragile” from the truck along the line to the last man, who was to load the trolley with them. I soon put a stop to that. So these men need supervising. If you decide to ship your goods before you have chosen your home, you will find that there are no storage facilities here. So you will either have to keep your goods where you are living – fine if you have the space – or rent an apartment for your goods. Moving locally is a whole other matter. It seems impossible to rent a lorry so that you can do it yourself. 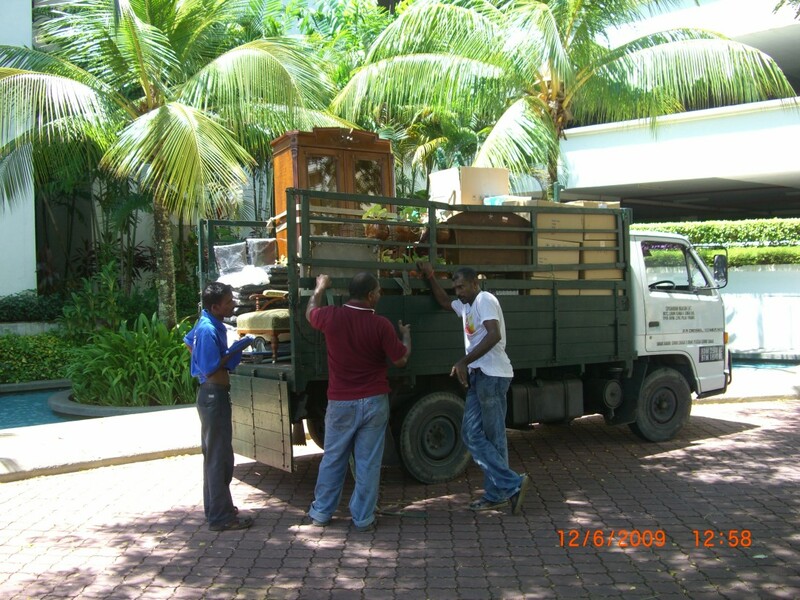 But finding good local removalists is very difficult, at least for a reasonable price. You can book a lorry and the number of men you think you need for the job, but you do need to supervise closely. This will cost upwards of a few hundred ringgit. But for many of my things I didn’t trust anyone else, so I made multiple trips by car, in addition to using the lorry. As I have moved around a bit I have also found that the lorry drivers seem to have very little idea of the roads in Penang, despite them living here, so I have had to have them follow me. 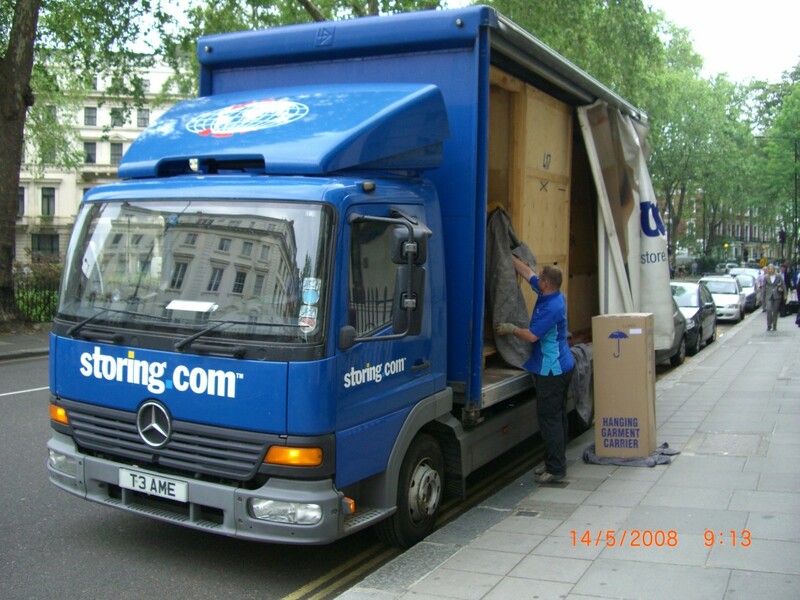 Some lorries have no roof, so if there is any possibility of rain on your moving day, ensure the one you hire does. Your estate agent can help with organising the utilities, post etc. If you are using TM for your phone and or Internet, they can take weeks to transfer the connection, and they will still charge you even though you had no connection. When you complain you’ll get a refund. So, go into their office and stress it is urgent. When we did this in their main, Burma Road, office, it took two days – and they gave us a free new phone, even. 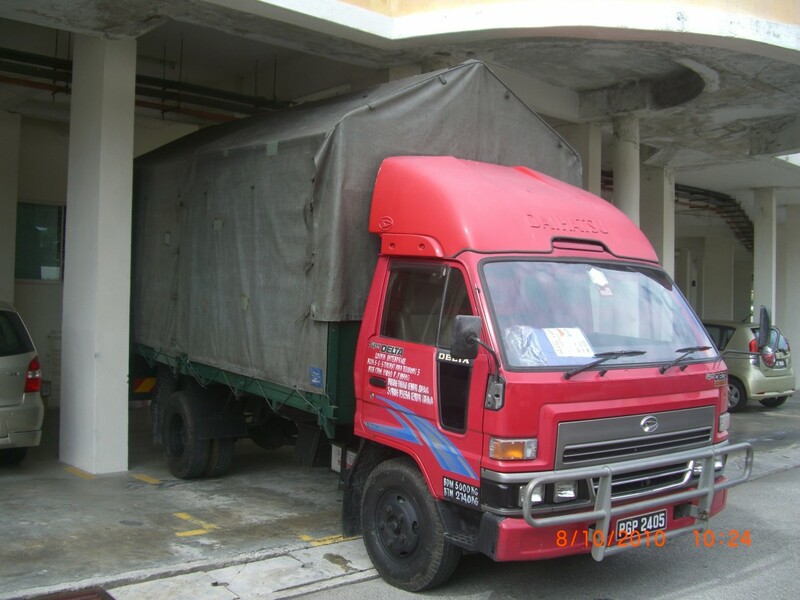 If you live in a condo you’ll need to inform management, and security, about your moving, and probably the number plate of the lorry. So, there are a few tips. If I recall others I will add them, but it has been a while now since we last moved.